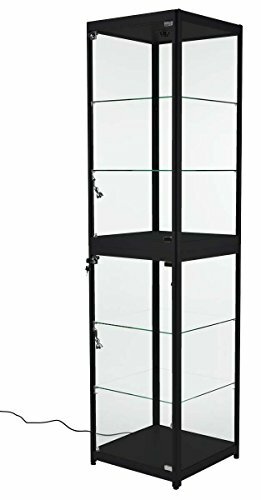 This trophy cabinet is a perfect showcase in high end retail stores and galleries, high school or college corridors, hospital reception areas, professional offices and salons, and more. Adjustable foot levelers keep this showcase stable on uneven floors. A convenient wheeled hard shell carry case makes this tall case super-portable. This lighted tempered glass cabinet helps retailers create a dramatic focal point in commercial settings for merchandise and exhibit items.